Forces while in Alexandria, Virginia. He served in the United States Air Force and in three years of service, he attained the rank of Captain. service of our country in North Vietnam. Lockhart, George M. Lockhart, Colonel, United States Air Force, World War II, Korea. No dates on his stone in Section 11. On 21 December 1972, a B52 bomber from the 72nd Strat Wing, Anderson AFB Guam, was sent on a bombing mission during the famed Christmas Bombings during that month. Between the 18th of December and the 21st, when the B52 departed for the Hanoi region, 8 B52's and several fighter bombers had been lost, and 43 flyers had been captured or killed during the same period. A very high percentage of B52 aircrew were captured immediately and returned in 1973, a much higher percentage than strategists imagined. Beyond that number, several were known to have made it safely to the ground, yet did not return for unknown reasons. When the B52 from 72 Strat Wing, Guam was hit by a surface-to-air missile in the early hours of 21 December 1972, the fate of the crewmembers was varied. Multiple emergency beepers were heard by aircraft in the area, indicating that several of the crew members had safely bailed out of the crippled aircraft. James Lollar was captured and subsequently released in March the following year. The U.S. did not know he had been captured. Ronald Perry's remains were returned exactly 3 years to the day from the day he was shot down. The remains of Randall J. Craddock, Bobby A. Kirby, George B. Lockhart and Charles E. Darr were returned six days short of the sixteenth anniversary of their shoot-down. The positive identifications of the second group to be returned was announced in August 1989. Another returned POW, Ernest Moore, mentioned that he believed Darr had been held at the "Zoo" in Hanoi, but the U.S. never changed Darr's status from Missing to Prisoner. There is every reason to suspect the Vietnamese knew what happened to all the crewmembers, but especially Charles E. Darr. Whose radios beeped in distress from the ground that day in December 1972? When and how did Bobby Kirby, Randall Craddock, Charles Darr, Ronald Perry and George Lockhart die? If any of them were prisoners of war, why did we allow the Vietnamese wait 16 years to return their remains? 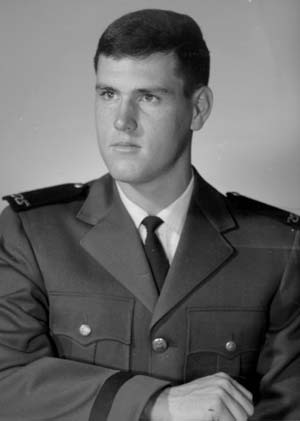 George Barry Lockhart is a 1969 graduate of the United States Air Force Academy. Note : The DPMO and POWNetwork list Lockhart's home city of record as Sulphur Springs, Texas; the VVMF (The Virtual Wall) lists his home city of record as Alexandria, Virginia. George Barry Lockhard was the son of George M. Lockhart, Colonel, United States Air Force. Captain Lockhart was a graduate of the United States Air Force Academy. They share a common headstone in section 11 of Arlington National Cemetery, but there are no dates on the Colonel's portion thereof.